Despite its luxury focus the Levante has off-road features such as hill decent. THE speedo is reading 200km/h-plus as the Maserati GranTurismo bellows towards turn one at Sydney Motorsport Park. Even at this pace it is impossible to get a fix on the huge coupe's velocity because it is still building momentum like a rhino on the charge and the needle is sweeping accordingly. And then you ease off provoking the 4.7-litre V8 and dab the Brembo brakes to bleed that speed off so that the feisty Italian sports car doesn't put a gouge in the Eastern Creek scenery. Driving a Maserati is an experience: the ethos behind all the trident-badged vehicles is luxurious travel for four adults on autostradas and cobbled village roads. 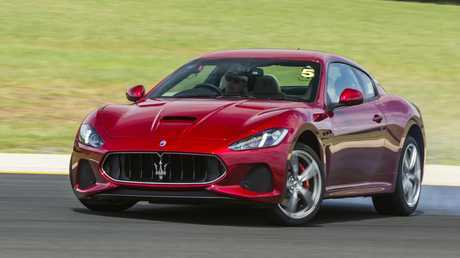 Maserati Gran Turismo is built to go fast. Driving a Maserati on the track reinforces how the Italians also value what they call "veloce": the engines are built by Ferrari, all cars are fitted with a mechanical limited-lip diff to help sling around a corner and the weight distribution hovers a couple of per cent either side of the ideal 50-50 split. So they accelerate, handle and hook in with more prowess than indicated by the leather-wrapped interiors and relatively reserved bodywork. The same holds true even of the most affordable - and by rights the most unwieldy - Maserati, the Levante mid-sized SUV. 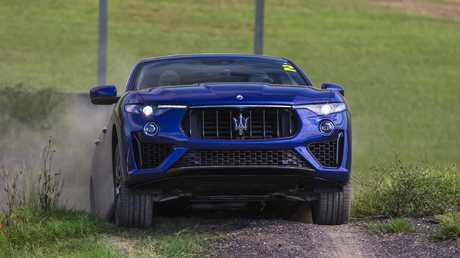 The two-tonne beast uses adaptive air suspension to counter body roll and fore-aft pitching and a couple of laps around the Sydney circuit show it loses little in terms of cornering stance or steering feedback to a similarly powered Ghibli sedan stablemate. Maserati has just launched a V6 petrol version of the Levante at $125,000 plus on-road costs. The twin-turbo 3.0-litre is good for 257kW/500Nm and undercuts the previous (diesel-powered) entry model by $15,000. 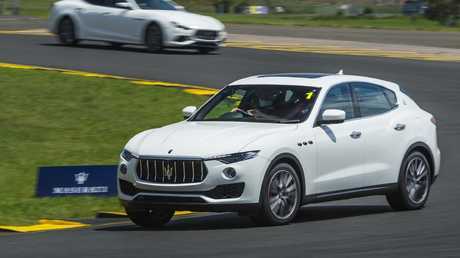 The Levante is still dynamic on the track despite its weight and height. 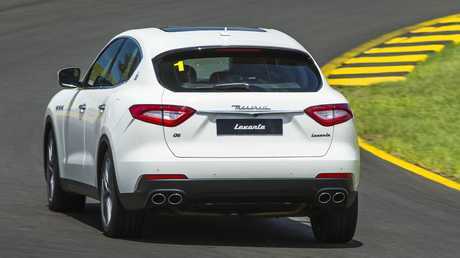 Maserati Australia chief operating officer Glen Sealey expects the new version to push Levante's numbers well beyond the 54 per cent of the model mix for which it already accounts. "It's no secret SUVs are taking share from sedans and the Levante shows that holds true for us," Sealey says. "Would we like a smaller SUV? Yes but not at the expense of our brand values, so I don't think you'll see a Maserati with a four-cylinder engine. "We'll look at hybrid and electric versions to cut emissions but our customers expect a Maserati to sound - and go - like a prestige Italian car, so a 3.0-litre six is probably the minimum. Sealey is also happy to tout the fact the Levante is $9000 more expensive than one of its obvious rivals, the Porsche Cayenne. The Levante is the brand’s best selling model by a wide margin. "Our options list isn't as big as some companies because we listen to our customers and spec the cars based on their needs," he says. "In the case of the Porsche, we've got more power, more torque … standard inclusions on the Levante that you have to pay for on the Porsche include adaptive air suspension, a full leather interior, heated seats … the list goes on." As part of the Maserati drive day, the Levante was subjected to an off-road course that would leave owners mortified at the potential for damage to the 21-inch alloy wheels and triple-coated paintwork. Riding on road-oriented Pirelli P-Zero rubber, the Levante scrambled up 35 degree dirt inclines and control-skidded - using the hill descent software that tweaks the brakes to hold a set speed - down a similarly slippery slope. Maserati sold 642 vehicles last year, almost 100 fewer than in 2017. Sealey attributes the dip to pent-up demand for the Levante when it launched two years ago, along with a general softening of the premium market. "We've always aimed for about a five per cent share of the prestige market and we're hitting those targets," he says. "The big deal for us is about 90 per cent of Levante sales are to first-time Maserati customers, so we're growing the family rather than just having existing customers buying another car or trading up. "We've had people trade in everything from German SUVs to a Fiat 500X and Nissan X-Trail." 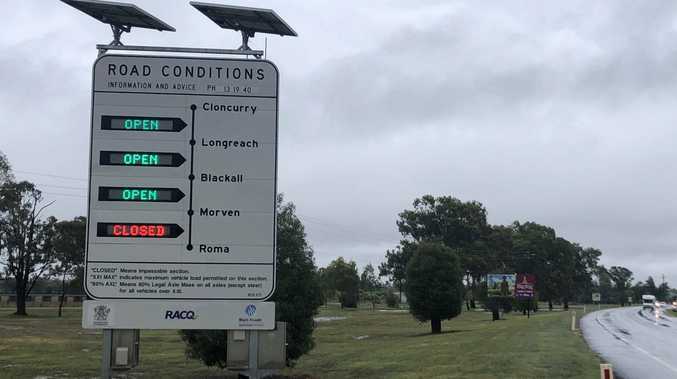 Breaking ONE of southwest Queensland's main thoroughfares has been cut off by floodwaters. News Miles resident shares her story and tips for happiness.